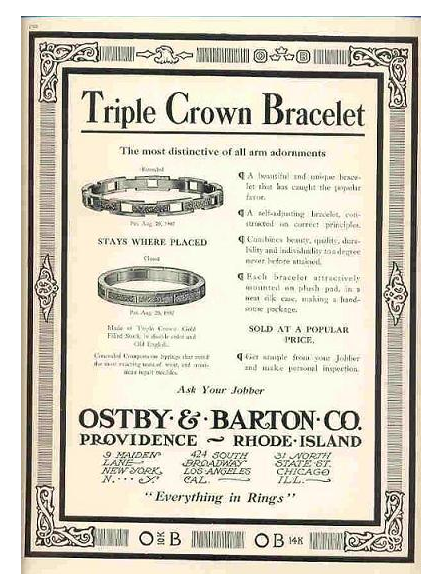 Ostby & Barton pieces are rare and collectible examples of jewelry because the co-owner of the company, Ostby, was a first class passenger on the Titanic & was one of the 1,500 passengers who perished during the tragic iceberg collision. The company was established in 1879 in Providence, Rhode Island. At it's time, it was considered one of the leading producers of fine jewelry. The company ceased production in the 1950s. Ostby & Barton jewelry is highly desired by collectors of fine antique jewelry for its beautiful workmanship & historical significance. Maejean Vintage has been fortunate to have gotten in many pieces of Ostby and Barton jewelry, and they always seem to sell very quickly. Both my sister and I have Ostby and Barton rings in our personal collections. We will likely never part with the special heirlooms! Here are some pieces of jewelry from Ostby and Barton we either have available or have already sold.